Allegory of Poverty by Giotto (di Bondone), ca. 1330. Giotto practically invented Renaissance art, and the four frescoes painted in the Lower Church of St. Francis in Assisi, depicting the vows of Franciscan monks, are some of his finest work. 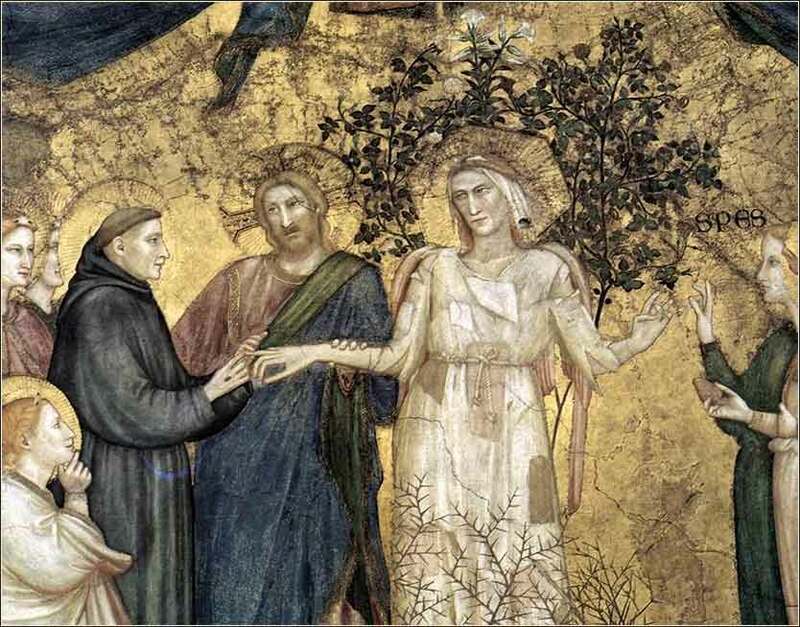 Here, Giotto represents the mystic marriage of St. Francis with Poverty. Hope and Love are the bridesmaids, angels are the witnesses, and Christ himself blesses the union. The bride's garments are patched, ragged and torn by brambles, children throw stones at her and mock her, and St. Francis looks with love upon his bride. 456 people in our community are currently praying with you. This record was made at Sam Cooke’s very first recording session in 1951, when he was 19. It sold over 65,000 copies, which was an excellent showing for a debut gospel recording. I want to let His praises swell. and it was not in the well. came to the well to get some water. There she met a stranger who did a story tell. and did His wonders tell. who did His wonders tell. Almighty God, the giver of all good gifts, in your divine providence you have appointed various orders in your Church: Give your grace, I humbly pray, to all who are called to any office and ministry for your people; and so fill them with the truth of your doctrine and clothe them with holiness of life, that they may faithfully serve before you, to the glory of your great Name and for the benefit of the church of all faithful people, now and until the end of days. May I go in peace, with God and with his other children, and may we love one another as Christ taught us. May I follow the example of good men of old, and may God comfort and help me and all who believe in Him, both in this world and in the world which is to come. 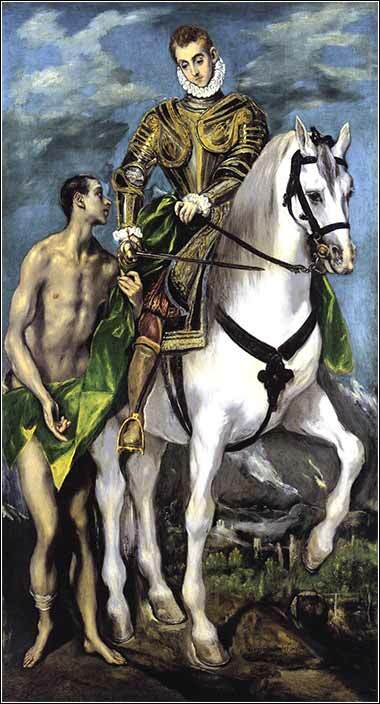 El Greco (c. 1598) depicts St. Martin tearing his cloak, to give half to a beggar. You’re just a prayer away from a change of heart. Be sure to set aside a tenth of all that your fields produce each year. Eat the tithe of your grain, new wine and olive oil, and the firstborn of your herds and flocks in the presence of the Lord your God at the place he will choose as a dwelling for his Name, so that you may learn to revere the Lord your God always. At the end of every three years, bring all the tithes of that year’s produce and store it in your towns, so that the Levites (who have no allotment or inheritance of their own) and the foreigners, the fatherless and the widows who live in your towns may come and eat and be satisfied, and so that the Lord your God may bless you in all the work of your hands. Christians have no Scriptural obligation to give one-tenth of their income to the church. One must, initially, differentiate between passages about giving to the church from passages about giving to the poor. The New Testament rules about how much to give to the church can be summarized as "as much as one has decided in his heart", given in 2 Corinthians (above). On the other hand, Christ's advice about the optimal amount to give to the poor is, basically: "go and sell all your possessions and give the money to the poor. "Matthew 19:21. There have been, at least historically, churches which have led their members to believe (or outright misrepresented the Bible to them) that they have a Christian obligation to give one-tenth of their income to them. This is error. The problem with using one-tenth even as a guideline from the Old Testament is that the obligations of giving imposed upon the Hebrews are extraordinarily complex, confusing, and possibly contradictory. Even Jewish authorities do not agree on what the Old Testament requires. Today's Scripture — just one of many of the statements in the Pentateuch — demonstrates this. The Exodus passage requires that one-seventh of a person's agricultural yield be left for the poor. The Deuteronomy passage does require one-tenth by set aside as a tithe; but it then states that this tithe is to be taken to Jerusalem and eaten by the person who gives it! Except that, every third year, this tithe is to be stored for the use of the hungry. There are other tithes of one-tenth, notably a tithe to the Levites (Jewish priesthood), and gifts of other amounts stated in the Old Testament, and there are complex rules about many of them; but we have diverged enough from our reading of Exodus. In summary, we can say three things from the Scripture examined today. First, a rule of giving one-tenth of one's income to a church is the creation of that church, not the Bible. Second, we are instructed to set aside money every week for maintenance of the church as our first financial priority. And third, our guideline for giving to the poor is everything we own, at least in excess of what we need for our bare maintenance.